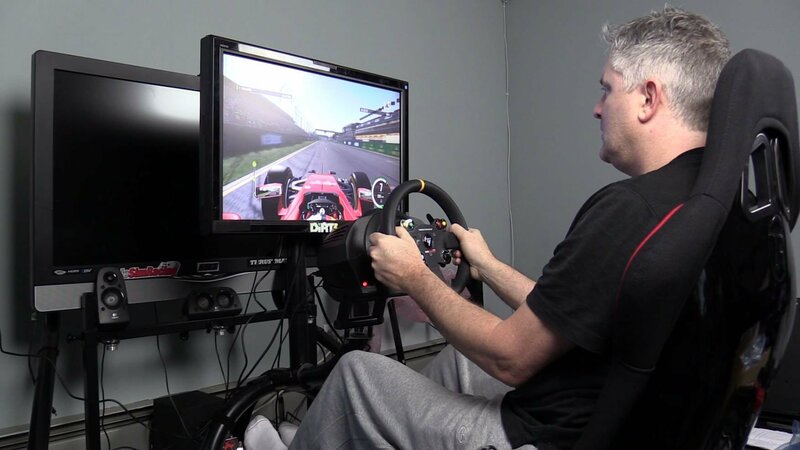 Presenting our review of the Trak Racer RS8 Mach 4 Racing Gaming Simulator Cockpit. The RS8 can be purchased for $649 from www.trakracer.com and features 2″ diameter tubing, a real race car seat, fully adjustable wheel mount, pre-drilled wheel, pedal and shifter decks, monitor mount and a 10 year frame warranty. Building the RS8 was a pretty straight forward process, despite the sim racing industry standard vague instructions. With not that many pieces and parts, the build was pretty self-explanatory and didn’t take long to complete. Mounting the hardware wasn’t as straight forward. The hole pattern for Thrustmaster wheels is right above one of the two wheel deck hinges, making it impossible to tighten the M6 bolts. This forced us to take the hinge apart – something were not sure was ever intended by Trak Racer – to secure the wheel to the deck. Luckily, this issue should be a one time deal. It does appear that only the Thrustmaster hole pattern is impeded by the hinge, and shouldn’t be an issue for other wheel brands. Of course, there are a lot of people running Thrustmaster wheels these days, and taking apart the wheel mount with tiny, hard to put back, washers isn’t ideal. The pedal plate was also an expedition. Initially, we mounted the plate as the instruction and pictures show, with the front and back of the plate bolted to the frame. Then we installed the Thrustmaster T3PA pedals and there was a problem. The Thrustmaster hole pattern puts the pedals right next to the frame. So close in fact that your feet actually hit the frame. Our first solution was moving the pedals forward to the bottom of the pedal deck, but that made the rig impossible to use for 6’4″ Darin. It even forced 5’6″ John to slide the seat all the way back to fit. To fix this, we disconnected the backside of the plate to drop it. This created the space we needed to use the pedals but it created two potential issues. First, you lose all rake. Second, if your rig is on hard floors, you need to put something underneath it to insure you don’t scratch up the floor. In comparison to the wheel and pedals, attaching the Thrustmaster TH8A shifter and monitor was a breeze, with no issues whatsoever. Let’s now talk about how it performed. In use, the RS8 has strengths and weaknesses. There is nothing bad we can say about the decision to use 2″ diameter tubing. The entire chassis – wheel, pedals, shifter, monitor – is extremely stable and exhibits no noticeable motion while driving. The compactness of the chassis is also appreciated, taking up no more floor space then it has to. Overall, the fiberglass seat is good. It’s one piece, GT style, so any reclining adjustments has to be done via the four mounting holes available on the seat uprights. Most importantly, it offers good support in all the places you need it. With that said, we do have a couple critiques of it. The bottom cushion is a little thin and the side bolsters are pretty tight. Darin was just able to fit with a 34″ waist, and if you’re circular shaped, then you probably won’t. Like the seat, the shifter mount is solid. If there is one thing we wouldn’t mind seeing it’s some forward-aft adjustability. This wasn’t an issue for the Thrustmaster TH8A shifter, which could be mounted on the front or back of the mount. But other shifters that can’t do this, like the Logitech G shifters, may not be in quit the right spot depending on how tall you are. The adjustable wheel mount performed really well. The double hinge design offers a good amount of adjustability and it was surprisingly sturdy when the large bolts were tightened down. The only negative was disassembling it to mount the Thrustmaster wheel but once that was done there were no issues. The monitor mount was one of the big surprises of the RS8. It performed flawlessly. It’s sturdy and the additional console holder on the back is a nice touch, although, it would probably be a good idea to secure your console with a Velcro strap, just in case things start rocking and rolling. This leaves us with the pedals and a design decision that at first we didn’t understand but think we have figured out. After not being able to comfortably mount the T3PA pedals, we decided to try out other pedals. Neither the Fanatec ClubSport V3 pedals – using both pedal pads – or the DSD’s fit when the pedal plate is elevated. But the Logitech pedals do, quite comfortably too. So it appears like the pedal area was designed based on Logitech pedals only, which is an issue. This has forced us to only secure the front of the deck, causing the pedals to be leaned back, making them a bit uncomfortable to use because you have to extend your foot and ankle further than you would in a normal driving position. If the roll hoop and wheel tubing were squared off, the rake position would have worked perfectly. Instead, we’re left having to run the chassis in a somewhat compromised layout. This is a tough one. There’s a lot of things to like about the Trak Racer RS8. Super sturdy, small footprint, nice looking style, adjustable wheel deck and clever monitor mount. But that pedal area. The lack of space around the pedals – and the steps you need to take to fix it – might be a deal breaker. For Logitech G25-G29 users, this won’t be an issue at all. For Fanatec, Thrustmaster and other options, the flat pedal deck is usable, but not ideal for something that needs to keep you comfortable and performing at you best for hours and hours. We have brought this to the attention of the guys at Trak Racer and they are formulating a solution. If the pedal area was bigger, this would certainly be one of our favorite chassis.